Discover 1000 years of the UK's history within one iconic building. Insightful and entertaining guided tours last 75 minutes and are available throughout the summer recess of parliament, typically during August and September and, from July, 2010 , tours will be available on Saturdays making them accessible to visitors year round for the first time. Tours run throughout the day and offer the opportunity to discover the fascinating blend of history and politics that lie within one of the most instantly recognisable buildings in the world. Also known as the Palace of Westminster, 1000 years ago it was the official residence of the English royal family. The oldest part of the building is Westminster Hall which was completed in 1097 and has held a central role in British history since then. The majority of the original palace was destroyed by fire in 1834 and the magnificent Gothic-Revival building which now stands, majestically, in its place was designed by Sir Charles Barry and completed in 1870. While the outside of the building is well known the guided tours allow visitors to discover the many treasures within the building such as the spectacular fixtures and fittings designed by the exquisite craftsmanship of A.W.N. Pugin, including the wonderful throne in the Lords chamber, and a rich collection of works of art. Led by a fully qualified Blue Badge Guide, the tours follow the processional route taken by Her Majesty the Queen when she performs the State Opening of Parliament. 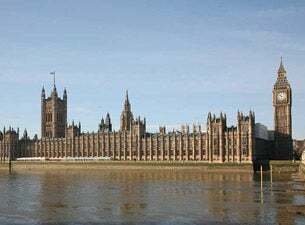 The tours take in the Lords and Commons Chambers plus other highlights such as Westminster Hall, the Queen's Robing Room, the Royal Gallery, Peers' Lobby, Central Lobby, Members' Lobby and St Stephen's Hall.